I have always dreamed one day I would embrace my weird name: Hopwood. For most of my early years growing up in America, kids would beat me up when they found out my real name. They said I should have been named Bob. Or Steve. In fact, on my first day of pre-school, I fibbed at roll call and claimed I was another child named “John”. As authorities panicked and searched for me, I finally fessed up. Of course I got beat up for that too. I came to accept that this is how life would be… Until one day when I recently found out the name is actually connected to my centuries old ancestral home in England named “Hopwood Hall”. It felt like I finally belonged somewhere! If I am the last Hopwood alive to spend the time, money, and sacrifice to save Hopwood Hall – I must! Otherwise, it will be gone in less than 10 years. The time is NOW. Or 600 years of important history will be lost forever. Saving Hopwood Hall will be the biggest challenge I have ever taken on in my life. The rambling Hall is huge and needs millions of pounds to restore it to its grandeur. I will oversee doing the work myself and running the estate as well as helping with the grounds, gardens and farm… which presents a problem because I am freaked out by farm animals. 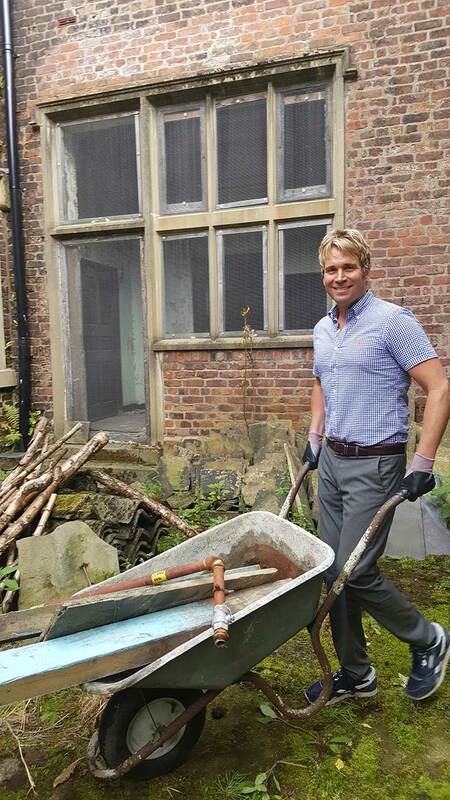 However, my dream is to restore Hopwood Hall to the incredible place it once was – a self-sufficient estate that will continue to tell stories for generations to come. Of course, I realize accepting this challenge is a crazy adventure. I am giving up nearly everything to make this happen. Job opportunities, relationships, and peace of mind. I sold my house in California and left my family and friends in America. Not to mention, due to English law protecting historical assets, I am told if any damage happens to Hopwood Hall I could go to JAIL! I hope you will join me on this journey! Of course, you are free to leave if it leads to jail.